Lately I’ve been thinking a lot about space. For example, so far my favorite of the sketches I’ve written with my comedy ensemble is almost entirely silent. This despite countless hours of writing and rewriting and working on other, more densely worded pieces. The space of silence. And I’m pretty sure the reason my garden isn’t as productive as it should be is because I filled every single square. The plants don’t have enough space to reach their full potential. Of course, as seems to be the norm of my life lately, the place where the concept of space has been most profound is yoga. One of my teachers has also been fixated on the concept lately. I don’t know if I got it from her or she got it from me or if we both came to it separately in the way that ideas float around the universe and land on people who are in the same place. But it doesn’t matter. What matters is this realization that growth requires space. I’m slowly learning that the insistent pushing and tight control I’ve always thought was necessary actually inhibits growth. Instead, it happens when I stop trying so hard, when I let go. Which does not come naturally, at least not at this point in my life. Yesterday I finally unpacked the last of the boxes left over from my move, including the ones marked “random,” which I’d left so long because I just couldn’t deal. Up til now my tendency has been to hold on. Not obsessively. I am no hoarder. But I find it difficult to let go, both physically and emotionally. So, yesterday, as I faced the boxes full of journals and photos and letters and a million tiny fragments of who I used to be and lives I used to have, I decided to practice this new concept of space by getting rid of everything. Of course, because I’m me, that didn’t happen. I had to go through it all first to make sure there was nothing essential. Which meant that my unpacking of these few boxes wound up being an all-day trip. I traveled through time, looking at snapshots and reading journals and letters that spanned decades. I succeeded in letting go of some things, but I kept a lot. And by the time I finished putting everything away I was spent, definitely not up to cooking. Yet I needed real food, something nourishing. Not cheese and crackers or chips and dip. My original plan for the day was to make frittata. With cauliflower and Swiss chard, something that I eat very, very happily every couple of weeks. Because It’s super easy and delicious. But, when the dinner bell rang, I had no taste for eggs. And no desire to cook. Although I had beans in the fridge, that was not what I wanted. Because, as much as I love them, one can only eat so many beans in a week. It’s true that I haven’t written much lately, which could be interpreted to mean that I have not been cooking and eating beans. But my silence means only that I have not cooked or eaten beans worthy of writing about. So it was with great reluctance that I pulled out some beans. Black ones. Then, behind the black beans, I found a small container of leftover kale that I’d sauteed a couple of days before and forgotten. In a flash of inspiration I remembered that on a whim the day before I’d picked up chevre. And suddenly, just like that, I was totally excited about dinner. In the space of letting go of my plan, I made up something new. Which turned out perfectly. The amounts listed below make a single serving. Multiply as needed. 1. Heat a well-seasoned cast-iron skillet over medium-high heat. (If you don’t have a well-seasoned cast iron skillet, rub a tiny bit of oil on the skillet before you heat it up) Warm the tortillas, turning, until lightly browned. Roll the tortillas together, put them on a plate, and cover with a kitchen towel or another plate so they’ll stay warm. 2. Add the greens to the skillet for a few minutes, until they’re hot. Put the greens aside and wipe out the skillet. 3. Return the skillet to the heat and add the grapeseed oil and a couple of tablespoons of water. Let it heat for another minute, then add the garlic. 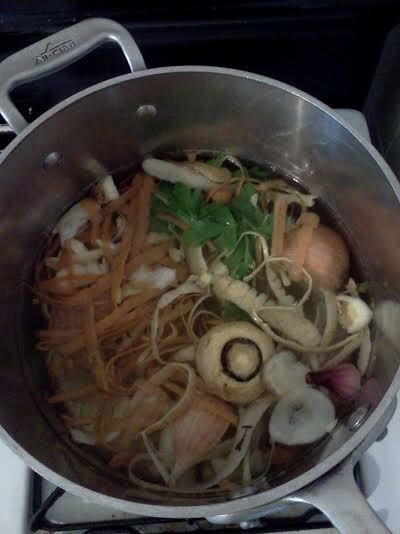 Saute for 3-5 minutes, until the garlic is very soft and the liquid has evaporated. Add more water if necessary. When the garlic is soft, add the black beans. Use the back of a wooden spoon to mash some of the beans. Stir, adding a bit of water to keep the beans from drying out, until heated through, another 3-5 minutes. To assemble the tacos, divide the black beans between the two tortillas. Add the greens. 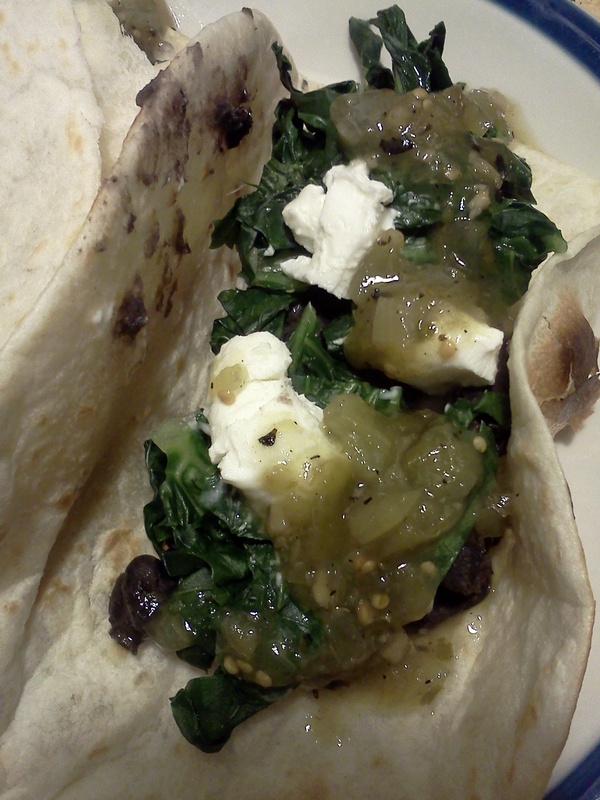 Then top with goat cheese and tomatillo salsa. You could certainly make your own salsa, and perhaps one day I will post a recipe. 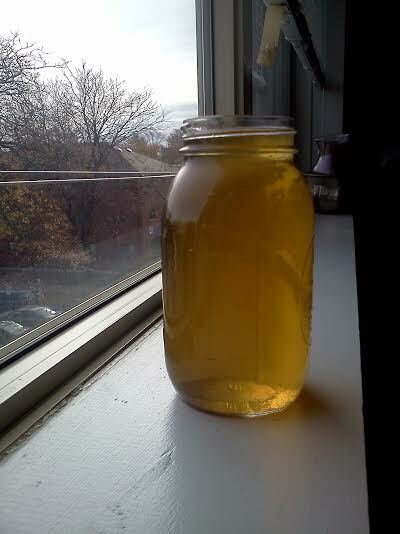 But this time, being lazy, I used a jarred version. Frontera. It was good.